As display advertising engagement weakens and content marketing growth expands, brands and publishers are using increasingly sophisticated tools to build consumer engagement. While the neuroscience approach has been frowned upon due to a lack of scale and scientific accuracy, the analysis of facial emotional response seems to offer a new data source. 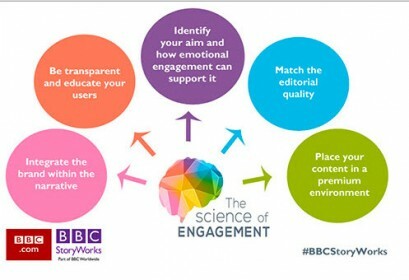 It’s an approach that has recently been embraced by BBC Worldwide in its latest native advertising research piece, “The Science of Engagement”. Placing in a premium environment will give your content credibility and allow it to flourish. The research piece was conducted across six global markets and the emotional responses of over 5,000 participants were measured with webcam based facial recognition technology. Key emotions captured include happiness, surprise, puzzlement, fear, sadness, and rejection. The BBC research shows that content quality and transparency around brand funding are the key factors for a positive emotional response towards native advertising. This might not come as a surprise to marketers experienced in the native advertising space, but it is the first time that a large scale research piece has confirmed what used to be an assumption. The biggest surprise was that, contrary to popular belief, the brand integration within the content narrative heightens the emotional engagement and enhances the brand image. Consumers don’t just accept native advertising as a format, they embrace those brands who create a premium content experience for them and who aren’t shy about mentioning their own name along the way. Ultimately, this research piece add weight to the argument that native advertising is the next step in the evolution of advertising partnerships between brands and publishers in a post-display advertising world. Since the birth of the first banner ad, it has taken the digital ad industry 20 years to start a productive discussion around ad viewability and whether or not advertising dollars are wasted. Questions around viewability, engagement, and emotional impact have been answered by native advertising within less than 5 years. Native advertising is no longer the shiny new toy but the new customer engagement reality we live in.